A few days ago, I walked past a book sale. On one of the sale tables was a battered copy of ‘How to Trace Your Italian Ancestors for Australians and New Zealanders’ for $1. I have no Italian ancestry, but I idly picked up the book and leafed through it. ‘Did you know that there was an Italian, Antonio Ponto from Venice, sailing with Captain Cook during his voyages of discovery on the Endeavour?’. I worked for several years at the Australian National Maritime Museum – which is home to the splendid replica vessel, HMB Endeavour. One of the most popular programs was a guided tour onboard HMB Endeavour led by an expert guide dressed in the guise of one of the two Italians, Antonio Ponto and James Matra, who were members of Endeavour’s crew. But I never thought to explore further about them. 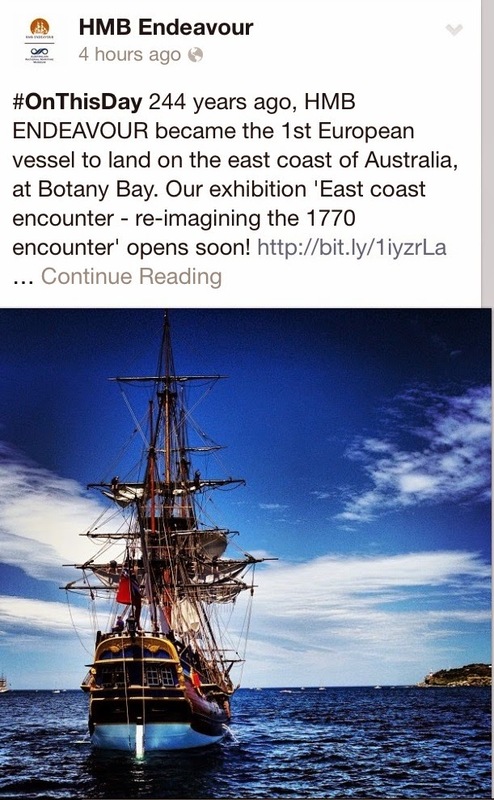 This afternoon, a post on Facebook from the Australian National Maritime Museum reminded me that on this day, 244 years ago, HMB Endeavour became the first European vessel to land on the east coast of Australia at Botany Bay. I've never come across Antonio Ponto's name included on the list of men who disembarked from Endeavour and came ashore to explore this strange new land. Nevertheless, his presence as a crew member means that a Venetian was one of the first Europeans to arrive at the east coast of Australia. James Cook (1728 – 1779) joined the Royal Navy in 1755 and served in the Seven Years’ War and surveyed the entrance of the Saint Lawrence River in Canada during the siege of Quebec. His skills came to the notice of the Admiralty and Royal Society and in 1766, he was promoted to the rank of Lieutenant and appointed commander of HM Bark Endeavour for the first of three voyages to the Pacific. The HM Bark Endeavour was a former merchant collier (coal carrier) from Whitby named Earl of Pembroke. She was built with a broad, flat bow and long box-like body with a deep hold. The Admiralty purchased her in 1768 for Cook’s voyage, when she was re-named and fitted with ten cannons and twelve swivel guns for defence against native attack whilst sailing in the Pacific. Cabins were built for Cook and Royal Society representatives including the official astronomer, Charles Green and official botanist, the wealthy Joseph Banks. Banks, in turn, funded seven others to join him on the voyage including Swedish naturalist Daniel Solander, two artists, a secretary and two servants. Cook’s mission was to sail to Tahiti to observe and record the Transit of Venus across the sun. On board with Cook were 73 sailors (including the two Italians, Antonio Ponto and James Matra) and Royal Marines. It took eight months of travel for HMB Endeavour to reach Tahiti, and unfortunately the astronomer Charles Green and Cook’s observations of the transit of the sun were inconclusive. Cook opened his additional sealed orders from the Admiralty. He was instructed to search the vast, uncharted waters of the south Pacific for signs of the rich continent of Terra Australis Incognita (unknown southern land). Cook sailed to New Zealand (he and his crew were the second group of Europeans to reach New Zealand, following in the wake of Dutchman Abel Tasman, who had arrived around 125 years earlier). Cook mapped the complete coastline of New Zealand with only minor errors. He then sailed west, reaching the south-eastern coast of Australia on 19 April 1770 and becoming the first recorded Europeans to encounter, map and record Australia’s eastern coastline. A few days later, on 23 April, Cook made the first recorded direct observation of Aboriginal Australians at Brush Island, and on 29 April, he and his crew made the first landfall at what’s now known as Botany Bay in Sydney. Continuing north along the coastline, on 11 June, Endeavour ran aground on a shoal in the treacherous Great Barrier Reef. The ship was so badly damaged that it took seven weeks to carry out repairs on the beach at modern day Cooktown in Queensland. Cook continued north sailing through the Torres Strait and on 22 August, he landed at Possession Island and claimed the entire coastline that he had just explored as British territory, on behalf of the reigning monarch, King George III. Cook and his crew then returned to England via Batavia where seven of his crew died from malaria and almost everyone on board became very ill. A further 17 men died as Endeavour sailed away from Batavia reaching Capetown in March 1771. It was a severely depleted crew that finally arrived on the island of Saint Helena in July 1771, four years since they first set sail for the Pacific. And what of Antonio Ponto? I plan to pop into the Australian National Maritime Museum soon to see if I can find out more about him. All I can really tell you right now is that he was a 24-year old from Venice, and what his life aboard Endeavour might have been like. Ponto sailed as part of Cook’s crew for four years in largely unchartered waters, facing rough and sometimes dangerous conditions. They were in real peril at many points during the voyage, especially when Endeavour ran aground in the Great Barrier Reef and when the entire crew fell ill from malaria at Batavia on their return voyage. Ponto’s name hasn’t appeared on any of the lists that I’ve seen of Endeavour’s losses so I presume that he survived. I’ve spent two nights helping to crew Endeavour, and this experience has given me an appreciation of what it must have been like to work, sail, eat and sleep as part of Cook’s crew. But I was in a safe, fully charted harbour, with a professional crew, radio contact with emergency services and with modern-day bathroom and cooking facilities. The experience has given me a huge amount of affection for that little, intrepid, flat bottomed coal carrier that found its way to Australia, and gave me the chance to live in this big, beautiful country. I have the utmost admiration for the tenacity and courage that Cook and his men – including one Venetian ableseaman - displayed during their four-year voyage of discovery. You can visit HMB Endeavour seven days a week at the Australian National Maritime Museum at Sydney's Darling Harbour - here's the link for further information about visiting hours.